My name is Melodee. And I am a coffee addict. But I probably didn't need to tell you that. If you see me every Sunday and any day in between I'm toting around my iced vanilla coffee from my favorite place with the green straw. Last Saturday as we were venturing out to go car shopping, my husband was getting ready to turn in the opposite direction of my green straw store and I stopped him and said sheepishly (as if he'd be surprised by my request), "uh, can we get coffee?" Unsure of his reply, I was relieved when he turned to go the right way. As we got down the road, I turned to him and said, "honey, are you annoyed that I asked to get coffee?" And his response is why I married him. He said, "I'd rather spend the $3 than have a cranky wife". I couldn't stop laughing because IT.IS.TRUE! But I realize that drinking that much coffee with all my vanilla syrup and cream isn't good for me. I can feel it at the end of the day. I feel even more tired and weighed down by the heaviness of the cream and syrup. So, since starting on my clean eating adventure, I've come up with a perfect iced coffee to make at home. Now, I've made iced coffee at home for quite a while and it turns out different every time...so I end up tossing it. How wasteful! I thought, why oh why am I having such a hard time making a good cup of coffee?! Surely it's not that hard! Well, my dear friends. I discovered that following the directions on the pack of coffee makes all the difference in the world. Are you laughing at me? Shaking your head and saying, "you're kidding me right?!" But it's true. I have a terrible time reading directions but since I did, I now make the perfect cup of coffee. You'll probably read my directions and think, "girl, you make this way more complicated than it needs to be!" And you're probably right. But I'm picky. I don't like the taste of coffee when you pour it over ice while it's still piping hot. It tastes terrible! So I will brew it 1 of 2 ways. 1. Cold Brew: In my french press, I add 2 tablespoons of coffee to 6 ounces of water and let sit over night, leaving the plunger up. In the morning I press the plunger all the way down. Then set a filter in a strainer that sits on top of a bowl and pour the coffee through to strain away all the grit. You don't have to do the second strain, it's just my preference. I could probably avoid it if I used a coarser ground coffee. If you have a coffee pot (I don't) you can strain it through a filter that way. Just pour directly into the filter and let it pour into the pot. After it's strained, I pour in a glass, add ice, creamer and enjoy! 2. Hot Brew: In my french press, I add 2 tablespoons of coffee to 3 ounces of hot water and stir. (I usually double or triple this batch). I let sit while I'm getting the boy's breakfast ready, about 5-10 minutes. Then I press the plunger down, stir and pour the coffee through my filter. I temper the coffee by adding the same amount of water as I used to make the coffee. (If you make it with 6 ounces of hot water, add 6 ounces of cool water. Or add 12 ounces if you started with 12oz). If I want a stronger coffee, I won't add as much cool water. I have found that tempering the hot coffee makes a less bitter taste when pouring over ice. Then I prepare how I like it and enjoy. I have an Iced Coffee Brewer on my Christmas List so hopefully my methods will be simplified! Haha! But then I'll have to learn a new method all over again. Don't worry, I'll read the directions the first time. 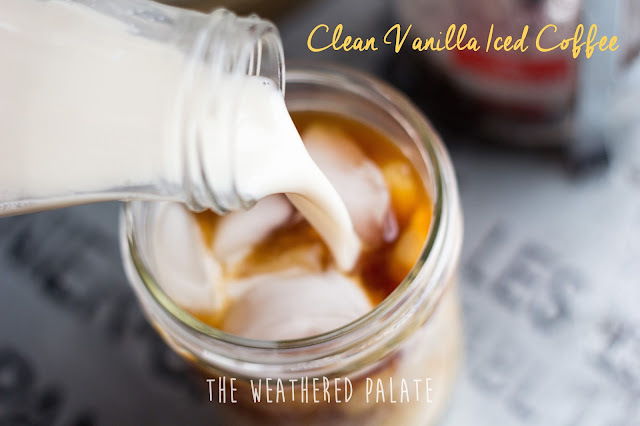 There are brews that are more suitable for iced coffee. One of my favorites is Kati-Kati, found at Starbucks usually during the summer. The coarseness of the grind really does matter, especially if you use a french press. If you grind it fresh in the store, make sure you pay attention to the grinder setting. I place the extra in a mason jar and keep it in the fridge. I don't make big batches because I don't like the taste of the coffee as it sits in the fridge all week. If I sound really picky, it's because I am. But now let's talk about creamer. Yes, I love vanilla syrup and half and half and it was hard for me to even think about anything else in my morning cup of joe. But not any more! I love this way even more than my vanilla and cream. 1. While brewing your coffee, add the sugar to the almond milk. Stir to dissolve. 2. Add to iced coffee. (I usually do a 1:1 ratio). Note: If you are on the 21 Day Fix, you'll want to limit your sugar to two teaspoons since that is what you are allotted each day. Some are strict and count their almond milk as a yellow container, but I kept it as a freebie. No since in using a container for 30 calories. If you use almond milk in your coffee, consider using water for your Shakeology for the day. Or if an additional 30 calories doesn't bother you, then use it in both. Just don't be too careless and keep your serving size to 1 cup.